During the late 1980s, Omega men living in the North Dallas corridor contemplated the formation of a new graduate chapter. Beginning in the latter half of 1988, two Omega men with a great sense of vision recognized the major impact a chapter of Omega Psi Phi Fraternity would have on the Plano, Richardson, Garland and Carrollton communities. These men, Brothers Earl Simpkins and William Burls, interacted with the South Dallas Chapter, Theta Alpha, to obtain the names and addresses of the majority of Omega men (affiliated and non-affiliated) residing in the targeted North Dallas communities. Their research led, in February, 1989, to the generation of letters of inquiries regarding the formation of a graduate chapter. An exploratory meeting was held at the Marriott Hotel on LBJ Freeway. Approximately thirty (30) Brothers attended this meeting. Brothers Simpkins and Burls presented the feasibility of establishing a chapter and the process applicable to making this dream a reality. In attendance was Brother Frank Drayton from Theta Alpha to lend his Chapter‚Äôs support for formation of the North Dallas chapter. Theta Alpha reinforced this support with the submittal of a letter of support which accompanied the application for a charter. On Saturday afternoon, April 29, 1989 approximately thirty-five (35) Omega men met at the home of Brother Earl Simpkins in Plano, TX. They were informed that all criteria had been met to apply for a charter to establish a chapter to service the North Dallas community. Brothers Simpkins and Burls, with the consensus of the body, proceeded with the application process. In June, 1989, the application for a charter and the names of the potential charter members were submitted. 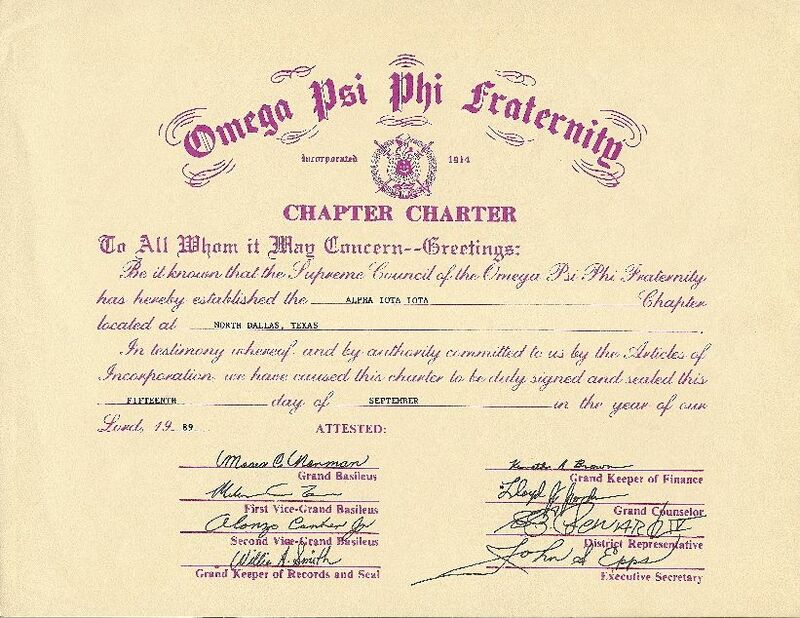 On September 15, 1989, the Supreme Council of the Omega Psi Phi Fraternity, Inc., Grand Basileus Moses C. Norman, established the North Dallas Chapter. It was proclaimed to be named ALPHA IOTA IOTA. Its charter members are listed to the right or left. The first formal meeting of the new Alpha Iota Iota Chapter took place on Saturday, October 14, 1989 in the Haggard Public Library in Plano. Brother William Burls presided over the meeting. The first order of business was the election of officers: William Burls, Basileus; Earl M. Simpkins, First Vice Basileus; Kenneth Chriss, Second Vice Basileus; Rodney M. Williams; Keeper of Records and Seal; George E. Ashford, II, Asst. Keeper of Records and Seal; Alcee Chriss, Jr., Keeper of Finance; D. A. Davis, Asst. Keeper of Finance; William H. Adams, III, Keeper of Peace; J. B. Wallace, Jr., Chaplain; and Harry Anderson, Jr., Chapter Reporter. These officers were installed by Brother Hendricks Cunningham, North Texas State Representative, on May 12, 1990. During its first year of existence, the Alpha Iota Iota Chapter was very active in completing the following activities: creation of The Omega Herald (Dec., 1989), a monthly newsletter; conducting the Purple Hearts dance, it first major fund raising event (February 1990); sent representatives to the Ninth District meeting in Austin (April 1990); coordinated its first family picnic (September 1990); held its first corporate worship service at the New Mount Zion Baptist Church (October 1990). Since it's charter, the chapter grown it's numbers through reclamation and 19 lines via the membership intake program.